For more information about us, please visit www.solarreserve.com. What does the Aurora Solar Energy Project mean for Port Augusta and South Australia? Aurora is a significant infrastructure project for Port Augusta and South Australia. It will be the largest solar thermal facility in Australia once built and its construction will create up to 4,000 direct, indirect and induced jobs. SolarReserve have entered into a Generation Project Agreement with the South Australian Government to ensure that a large percentage of the total project spend is sourced in South Australia and where possible Port Augusta. This will mean employment opportunities for people in the Port Augusta region, and flow on effects to local businesses in the community. Who is building the project? SolarReserve is the Developer and key Technology Supplier of the Aurora project, with its Asset Management division overseeing ongoing operations. We are in the process of selecting a general Engineering, Procurement and Construction (EPC) contractor for the Aurora project. We anticipate that a large portion of the equipment and services for the project will be sourced from South Australia in the construction phase. Interested suppliers should express their interest through the supplier portal for Aurora. Where will the workforce be sourced? SolarReserve is committed to creating employment opportunities in Port Augusta and South Australia and will, where possible, ensure the workforce is sourced as close to the project location as possible. A variety of skilled and unskilled roles are required during the construction and operations phases of the project. How many jobs will the Aurora Solar Energy Project create? The project will require a construction workforce of 650 full-time employees for a duration of 30 months, and the operations and maintenance phases will require 50 fulltime employees. On site construction employees will peak at more than 1,000. The project is expected to create up to 4,000 direct, indirect and induced jobs. Employment opportunities directly with SolarReserve can be found at www.solarreserve.com/careers. Please submit resume, cover letter, and salary expectations to: careers@solarreserve.com. Be sure to reference requisition code. To remain up to date on the project and future employment opportunities with SolarReserve as well as our construction contractors, please register below. Construction of the Aurora Solar Energy Project is expected to commence in early 2019. Where is the power going? Aurora will supply electricity into the National Electricity Market Grid and will be used to power South Australian Government assets such as schools, hospitals, police stations and government buildings. The additional generation capacity available from Aurora will be supplied into the electricity grid during peak times to help reduce electricity prices in South Australia. How long is construction expected to take? Construction of Aurora is expected to take about 30 months. How long will the solar thermal power station operate? With routine maintenance, we anticipate Aurora will operate for up to 40 years. 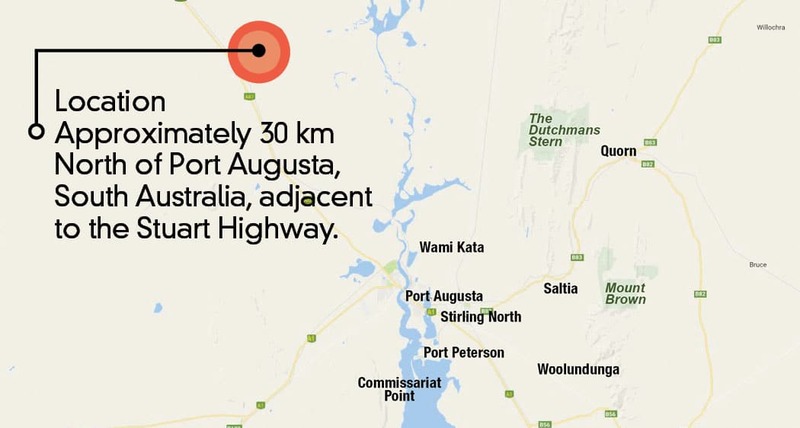 The project is located 30kms north of Port Augusta on the Stuart Highway.